Amid Political Crisis in Europe and America, Cryptos Stay Sluggish, But Why? There have been few more volatile years in finance since the banking collapse than 2018 which saw some stocks move more than cryptos and the value of some national fiat money drop by, in some cases, -50% or more. That financial volatility may have translated into political volatility this year as the west sits at the crossroads facing a number of difficult decisions. The US shutdown has lasted more than any other in history. A British Prime Minister lost a parliamentary vote by the biggest margin in history. The young have risen in France. Most of the Russian army forces sit next to Moscow. China’s economy does worry and even mighty Germany might be facing recession. 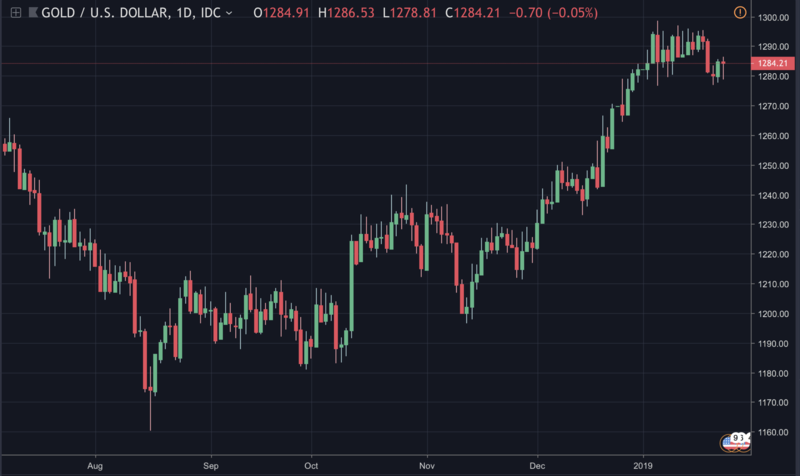 The considerable difficulties that present both dangers and opportunities have benefited the price of gold which has rise by 10% since August. Gold’s price on daily candles, January 2019. Cryptos, however, have not seen much gain despite some levels of uncertainty with the question remaining why. The reasons are probably many. Firstly, South Korean crypto trading volumes have plummeted. They used to dominate considerably. Now, you have to scroll down below 30th position to find a Korean Won crypto pair. That might suggest the many South Koreans who invested in cryptos have now invested out of it, so putting pressure on the price. You’d think that might be counteracted by the French, the British, or even Americans hedging some with cryptos in light of the current political difficulties. That may be happening to some extent, but for it to reflect on the price it has to happen at a level above $6.5 million worth of btc produced by miners every day in block rewards. That translates to some $2.5 billion a year or about 4% of bitcoin’s current market cap. On the other hand, the amount of new money actually invested and the amount reflected on the market cap are not the same thing. A $1 million purchase of bitcoin, for example, might move price up by $1, translating to a $17.5 million market cap gain. Making concrete analysis difficult in addition to potential considerations that most probably don’t think the political wranglings in the west risk an actual collapse. China’s active policy of devaluation in 2016, for example, or India’s announcement of certain notes needing replacement in the same year, probably gave many citizens good reasons to find safety in cryptos or other investments. While in US, part of the problem currently might be that the dollar is too strong, rather than too weak. In France, if they do peacefully transition to a jury style parliament or direct democracy, their economy and thus their money might become stronger because it would sort of become Switzerland. In Britain you could say they do have good reasons to worry because a no deal exit is seemingly becoming a reality by the day. Yet the pound has fallen so much it is now at almost dollar and euro parity while it was at 1.5x-2x before. Moreover, markets rose after May’s defeat with Labor now potentially backing a second referendum which might mean the pound could actually have some upside although there is the significant risk of no deal downside. So making a decision to flee to crypto not as clear cut as it may have been in China/India 2016 or other countries in 2017. While in 2018 there were plenty of nations which may have wanted to divest from fiat to other assets like cryptos, such as Turkey, Russia, Argentina, Iran and others, but it may have not been sufficient to overcome the selling. Russia, moreover, went mainly to gold with rumors their government might diversify some of it into crypto, but if they have at any significant level is not clear. You’d think they’d announce it after they bought enough, but it would probably require quite a bit of planning, studying, and all the other bureaucratic stuff, for them to actually hedge with crypto. So maybe in 2020. Another recent development has been the signing of a treaty by France and Germany with the aim of effectively uniting under one country regardless of whether the rest of Europe wants to join or not. The 2010 euro crisis showed that for the single currency to work there has to be a banking union. From there, you have to effectively end up with one government of a United Europe with its own army and so on because if you have one banking union then you’re one economy. So you’d think European nations would eventually become a bit like US states with their own president and prime minister or governor as they call them in US, but somewhat subordinate to the more EU wide administration. That’s kind of how it works already, just not explicitly. Europe in a way has part of the Swiss design where the heads of state of member states meet in a council, the European Council, and there set the agenda and sort of give orders to the European civil service, the European Commission, with the chair of the council, or EU presidency as they call it, rotating. The only thing missing here is citizens’ proposed laws/referendums, which is what the French people are demanding if they are to consent to this unification. Macron probably won’t have much choice but to give them what they want, especially as that specific one demand or the jury style parliament sounds quite reasonable. The potential danger (or perhaps reason for optimism), however, isn’t so much Europe, but the neighbors. A United Europe would probably tell US troops in Berlin and elsewhere in the continent to get out because such United Europe would be sovereign. It is not clear whether the United States would be able or willing to speak to such United Europe as an equal. Not least because the latter might ask them to stop playing in their backyard next to Turkey or next to Poland. Here the calculation would turn to the repealing of the arms treaty between US and Russia. Europe may well think they are being played as a buffer zone, with the joke card here being whether Russia thinks the same. If they do, one can see a complete normalization in EU-Russia relations. The latter might even get visa free travel in an integration within Europe to the point they friends because why not. From a United Europe perspective, they could further develop North Africa to perhaps even first world standards so that any refugee from that continent prefers it there. They could then integrate Turkey so that the other sides’ neighbors remain in their countries too rather than refugees flooding Europe by their millions. While where China is concerned, Europe could bring manufacturing far closer to their shores. Perhaps the balkans, the North Africa part or even all of Africa, and maybe some of Turkey’s neighbors. Because in the big picture, sending goods from China to Europe doesn’t really work. While from China to USA, ships are all that’s needed and ships can travel very quickly in that relatively short Pacific distance. The problem for America in this grand picture is that they could be surrounded by China on the one hand and Europe on the other, although divided by a massive ocean on both sides. They perhaps wouldn’t like such sovereign Europe which may be able to command once again the Suez Canal, so they might intervene or have intervened to try and break it up. That would be a considerable gamble which can’t easily be foreseen currently. America could instead sign a transatlantic free trade agreement that would deepen the friendship and the reliance of both on each other. Making Russia perhaps more unpredictable as if US troops do leave, they may try and test whether EU would stand by their fairly week borders where there isn’t quite yet much unification with national patriotism still dominating by far. Of course Russians would have in mind Germany’s invasion of Belgium back when and how massive of a miscalculation it was. They may also have in mind the Russian march towards France that was then met with Napoleon’s invasion of the then empire and the burning of Moscow. Yet, their intervention in Ukraine is an obvious warning to Europe in particular. The difficulty however is that it has been such a long time since there was an able Europe in the foreign arena that one can’t easily know whether Russia hates Europe or America. If the latter, then you’d think they’d send olive branches to France and Germany after the signing of this treaty. If the former, they’d be losing the opportunity of having a chance to be European, as they’ve always wanted. The above so being an overview of the potential dangers and the potential reasons for optimism with any flashpoint able to rattle the markets which might mean having some crypto as a hedge would probably make sense. Houses can be destroyed. Gold can’t easily be transported. Stocks are usually just an IoU from the stock-broker. Fiat of course would be inflated. The piece of code, on the other hand, can just be memorized. Of course we hope this on-going transition is peaceful and ends up in the greatest peace the world has ever seen. Armed intervention by the Americans is after all unthinkable. As it is from the Russians who can’t be so stupid as to unite Europe in effectively one second and do so with the anger directed at them, when one can see how Europe and Russia can work together very peacefully and to the benefit of both. So making this potentially one of the most optimistic times as far as imagination is concerned where it is applied to Europe, yet whether the opportunity will in fact turn into a golden age or something else, remains to be seen.